are you using free trial account ? Maybe you can check from the usage menu in Twilio, and ask their support what happened. 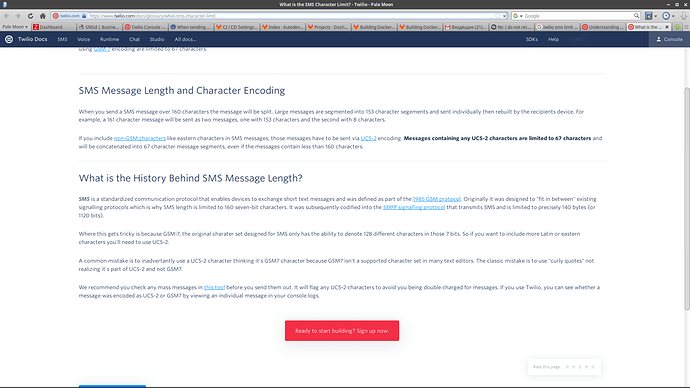 I read their latest doc, it should be able to send up to 1600 chars in one go as segmented SMS. For information, copy the letter that I wrote to them. I have a number of problems, please help. Hello! I have a service that is associated with Twilio using an API. I have a number of problems that try to fully consider Twilio as a potential partner. If you help, I will cooperate with you most effectively. Chaser API turns out to send SMS more than 160 characters I get an error: The message body exceeds the 160 character limit. Please help if there is a possibility to solve these problems. Thank.